This catalog showed up last week. Wow, I thought. Lands’ End is offering a whole bunch of US manufactured clothing. This should be interesting. After turning the cover, there were two more pages of puff about the wonder’s of “Made in the USA”. A two page spread followed of a sweat shirt and two more pages of gym ware – “Made in the USA”. Then, for the next 60 pages (excepting one page in them middle of “Made in the USA” wool socks) not another US manufactured item appears. Every page included the word “Imported”. 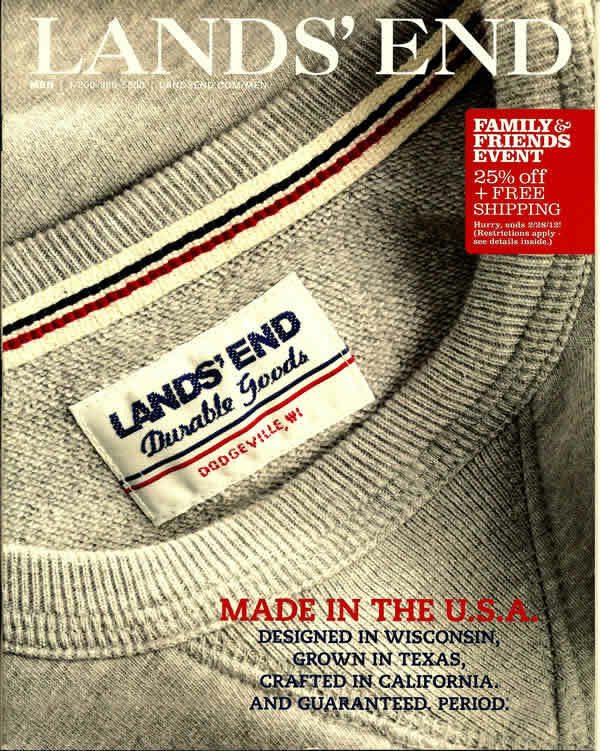 Undoubtedly the good durable clothing I expect from Lands’ End, but NOT “Made in the USA”.